Saree Makdisi est professeur de littérature anglaise comparée à l’Université de Californie Los Angeles, et auteur de Palestine Inside Out : An Everyday Occupation (La Palestine vue de l’intérieur : une occupation militaire quotidienne). Une copie de cet éditorial d’opinion a paru dans la version imprimée de l’International Herald Tribune du 6 Décembre, 2012. Source The New York Times, éditorial d’opinion, le 6 décembre 2012 (pour découvrir l’article original son iconographie et ses liens parents dans le texte suivre le lien du journal). "Israel Palestine : sinon deux Etats alors un" d’après "If Not Two States, Then One" de Saree Makdisi @ The New Yor Times, Opinion-ed, et traduit en français by Louise Desrenards is licensed under a Creative Commons Attribution-NonCommercial-NoDerivs 3.0 Unported License. Based on a work at http://www.criticalsecret.net. Le logo est une citation de la carte des colonies est et ouest autour de Jerusalem publiée dans The New York Times du 2 décembre 2012 où dans un format agrandi il est possible de les situer précisément ainsi que la zone E1 (suivre le lien). ISRAEL did not wait long to reveal its first response to the United Nations General Assembly’s overwhelming recognition of Palestine as a non-member state, almost immediately announcing its intention to push forward with plans to build housing for Jewish settlers in E1, an area of the West Bank just to the east of Jerusalem. 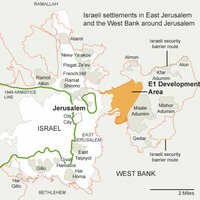 Although it is sometimes misleadingly referred to as “disputed” or “controversial,” settlement construction in E1 is no more and no less of a contravention of international law than settlement construction elsewhere in the West Bank or East Jerusalem. What makes this development significant is E1’s location, sealing tight the gap between East Jerusalem and Israel’s largest settlement, Maale Adumim, further to the east. That gap is the last remaining link for Palestinians between the northern and southern parts of the West Bank ; it also occupies the interface among and between the Palestinian communities of Ramallah, Bethlehem and East Jerusalem — which, apart from being the cultural, religious, social and economic focal point of Palestinian life, is also one day supposed to be the capital of Palestine. In moving forward with long-threatened plans to develop E1, Israel will be breaking the back of the West Bank and isolating the capital of the prospective Palestinian state from its hinterland. In so doing, it will be terminating once and for all the very prospect of that state — and with it, by definition, any lingering possibility of a two-state solution to the Israeli-Palestinian conflict. Oddly enough, the Palestine recognized by the United Nation is only an abstraction ; the one that Israel is now about to throttle is much more real, at least insofar as the throttling will materially affect the lives of hundreds of thousands of Palestinians in a way that mere recognition does not. However heavy the blow to Palestinian aspirations, an equally heavy political price for Prime Minister Benjamin Netanyahu’s E1 plan will be paid by Israelis. For by terminating the prospect of a two-state solution, Netanyahu will also be sealing the fate of an exclusively Jewish state. As cannier Israeli politicians (Ehud Olmert among them) have long warned, maintaining the existence of Israel as a Jewish state fundamentally requires perpetuating at least the idea of a Palestinian state, even if only as a deferred fiction kept alive through endless negotiations. Once the fiction of a separate Palestinian state is revealed to have no more substance than the Wizard of Oz — which the E1 plan will all but guarantee — those Palestinians who have not already done so will commit themselves to the only viable alternative : a one-state solution, in which the idea of an exclusively Jewish state and an exclusively Palestinian one will yield to what was really all along the preferable alternative, a single democratic and secular state in all of historical Palestine that both peoples will have to share as equal citizens. A campaign for rights and equality in a single state is a project toward which the Palestinians will now be able to turn with the formidable international support they have already developed at both the diplomatic and the grassroots levels, including a global boycott and sanctions movement whose bite Israel has already felt. For Palestinians, in any case, one state is infinitely preferable to two, for the simple reason that no version of the two-state solution that has ever been proposed has meaningfully sought to address the rights of more than the minority of Palestinians who actually live in the territory on which that state is supposed to exist. The majority of Palestinians live either in the exile to which they were driven from their homes during the creation of Israel in 1948, or as second-class citizens of Israel, where they face formidable obstacles as non-Jews in a state that reserves a full spectrum of rights only for Jews. For Palestinians, the right to return home and the right to live in dignity and equality in their own land are not any less important than the right to live free of military occupation. A separate state addressed only the latter, but there can never be a just and lasting peace that does not address all those rights, even if it means relinquishing the prospect of an independent Palestinian state. What must be added here is that if a one-state solution offers the last remaining key to a just and lasting peace, Israeli Jews will pay what will turn out to be only a short-term price in exchange for many long-term gains. Like Palestinians, they will lose the dream and the prospect of a state exclusively their own. But — also like Palestinians — what they will gain in turn is the right to live in peace.